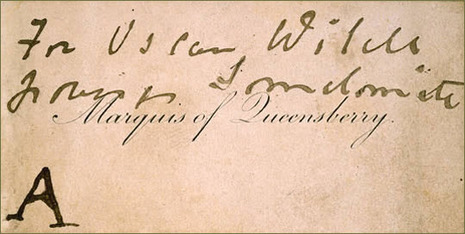 At the Albemarle Club where Wilde dined, Queensberry left his calling card complete with misspelling of the libelous word: "To Oscar Wilde, posing as a somdomite." Wilde felt he was left with no other choice but to defend his honor and sue for criminal libel. Queensberry had been stalking him, had threatened his livelihood and now insulted him publicly. Friends urged him not to sue, to shrug off the insult and move on, perhaps traveling to America or the continent. But Wilde would have none of it. He brought criminal charges against Queensberry and demanded satisfaction. The marquess expected no less and was prepared. In police court on Bow Street he made the statement that not only had he called Wilde a sodomite, he had done so for the good of the general public. This last statement was important, because now if Wilde lost, the government would have no choice but to pursue criminal charges for gross indecency. To do otherwise would show favoritism for the elite. When Carson began to ask Wilde about his relationships with named young men, Wilde became noticeably uncomfortable. The jury appeared astonished when Carson produced items ranging from fine clothes to silver-mounted walking sticks that Wilde admitted giving to his young companions. Suspiciously, the recipients of the gifts were not, in Carson's words, "intellectual treats," but newspaper peddlers, valets, or unemployed--in some cases barely literate. Wilde tried to explain: "I recognize no social distinctions at all of any kind, and to me youth, the mere fact of youth, is so wonderful that I would sooner talk to a young man for half-an-hour than be--well--cross-examined in court."